This would be my fifth visit to California, the first having been in 1983 when I went to see my cousin, sadly now deceased. For reasons to do with work this time I would be in the USA from Boxing Day into early January, which meant that the weather was likely to be better than at home, but the daylight hours would still be short. 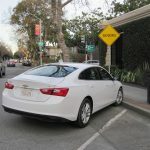 By the time I had got through immigration at Los Angeles Santa Ana airport, collected my case and picked up the Chevrolet Malibu rental car it was about 10.30pm. Emerging from an American big city airport at night can sometimes be a daunting experience, because they are often not in the best part of town. To avoid driving too far after the long flight I had booked a hotel close to the airport, and was pleased to find that it was in a smart business area surrounded by law firms, accountants and big company offices. 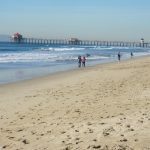 Santa Ana is about five miles from some of California’s best beaches, and that is where I headed the next morning after breakfast at the nearby International House of Pancakes. This meal seemed to be considerably more expensive in dollar terms than few years ago, compounded of course by the fall in value of the pound. 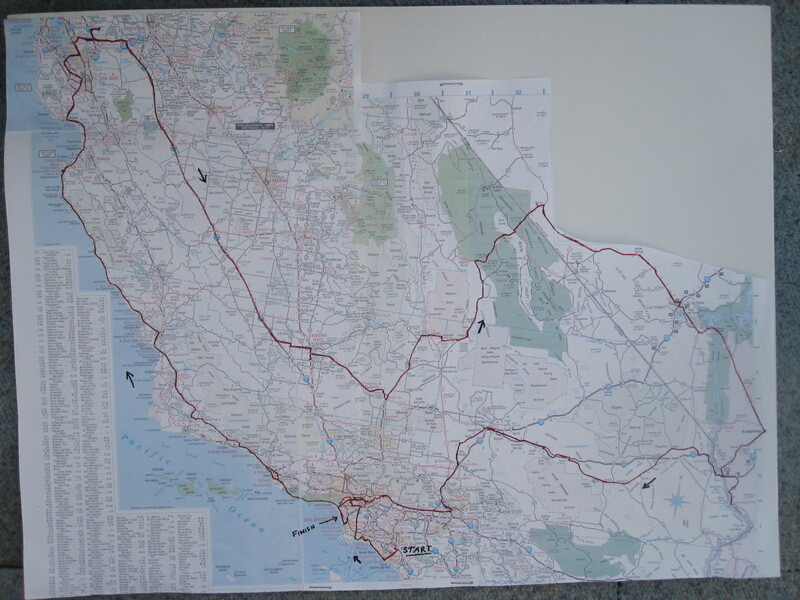 The road brought me through to the coast, and the Pacific Coast Highway, at Costa Mesa. From there I worked my way along, stopping to look at the resorts and surfing beaches, although the sea was too calm for any surfing to be going on. The weather was actually beautiful, cool early in the day and then becoming quite warm. 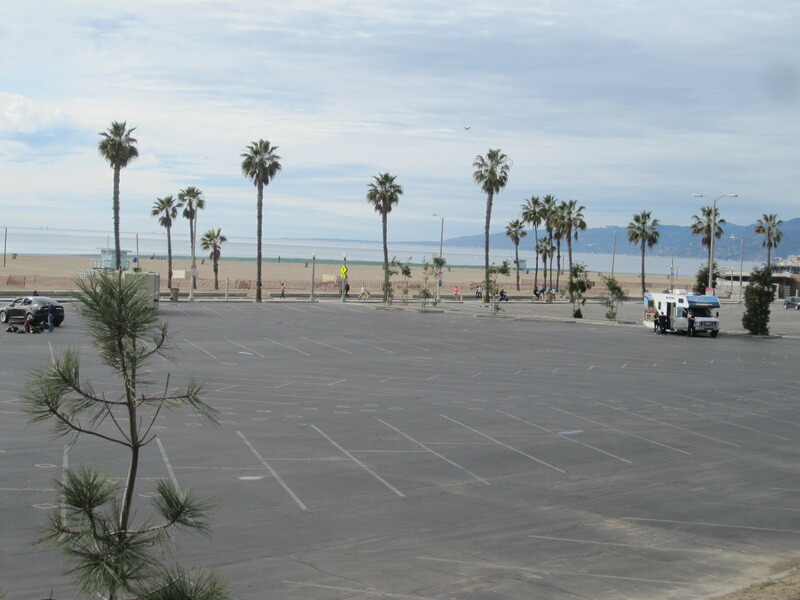 Huntington Beach, also popular with surfers, was almost deserted and absolutely covered with tyre marks, apparently from vehicles to do with beach maintenance, although why that should be I don’t know unless the lifeguards were just enjoying themselves. 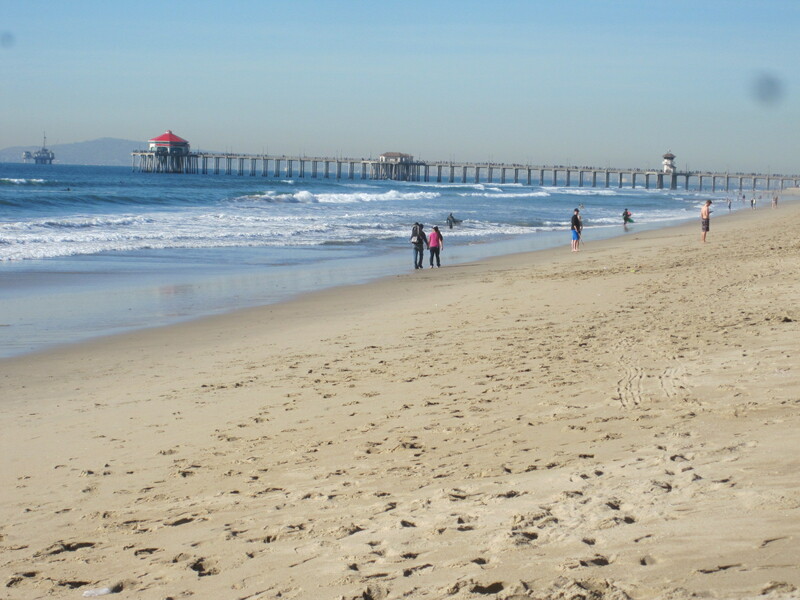 American beaches are mostly unlike those in Britain and Europe, with less intensive development and quite basic wooden fishing piers. 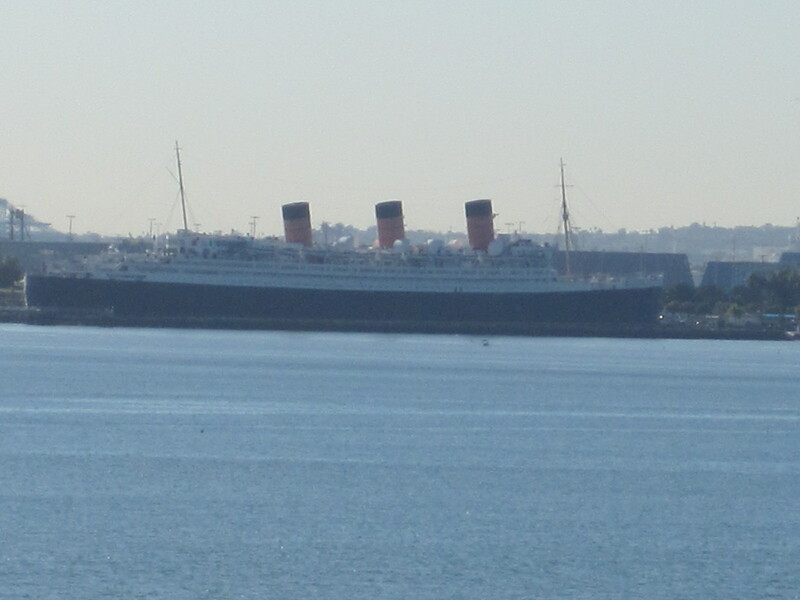 Seal Beach came next, and then Long Beach, which has for many years been the home of the old Queen Mary cruise liner. Now a hotel and conference centre, the ship can be clearly seen moored the other side of the harbour and is instantly recognizable by its traditional shape with three funnels. 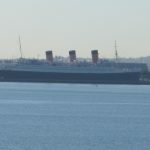 Long Beach is the second largest container port in the USA, and shortly after crossing the Los Angeles River the road joins the hectic freeway and rises up on to an immensely high bridge which affords stunning views of the harbour and container port, the likes of which I have only seen before in Japan. The freeway turned northwards towards central LA, and provided the first taste of the traffic congestion for which the city is famous by coming almost to a standstill for some time. From the freeway downtown LA looks a bit like a larger version of Croydon, with a bunch of high buildings sticking up above the surrounding area, but I turned off to the west before getting there and cut across to my night stop, a motel in West Hollywood. For my evening meal I went to the food court of the rather depressing Westfield shopping mall on the edge of Beverly Hills. Still jet-lagged, I set off early the next morning through a not yet very awake Beverly Hills main street leading up to West Sunrise Boulevard with a glimpse of the HOLLYWOOD sign between the buildings. Despite the associated wealth and glamour, most of the streets in the Hollywood area range from uninspiring to downright seedy, parts of Wilshire Boulevard being an exception with some striking architecture. Sunset Boulevard wends its way for many miles on twisty tree-lined roads through Beverly Hills and beyond, eventually coming to the Pacific Coast Highway near Santa Monica. Somehow I got diverted into Santa Monica and came across a free-standing boutique coffee shop where I stopped for breakfast. The clientele were rather odd to say the least. A long-haired man of about 70 with a straggly grey beard, heavy leather jacket over a fleece with the hood up, and shorts, deeply engrossed in a laptop. In the street outside, without the laptop, he would have been mistaken for a vagrant. He suddenly stuffed phones into his ears and started talking as he tapped away at the keyboard. Probably one of California’s leading website designers. A few tables away a younger man, similarly attired with hood and shorts, similarly immersed in his computer. A man in his 60s, with a wide purple band round his head and an obvious glass eye, sorting through a pile of papers. Two Indian (Asian, not native American) ladies. Back on the Pacific Coast Highway to Malibu in the Malibu. 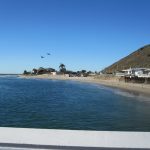 Considering its fame, Malibu is a surprisingly unimposing place, with the usual basic fishing pier and much smaller beach than you might expect. 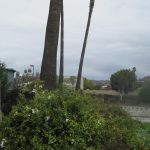 The land rises up steeply from the road leaving little room for development close to the beach. The weather was beautiful and I went for a walk on the beach and pier. 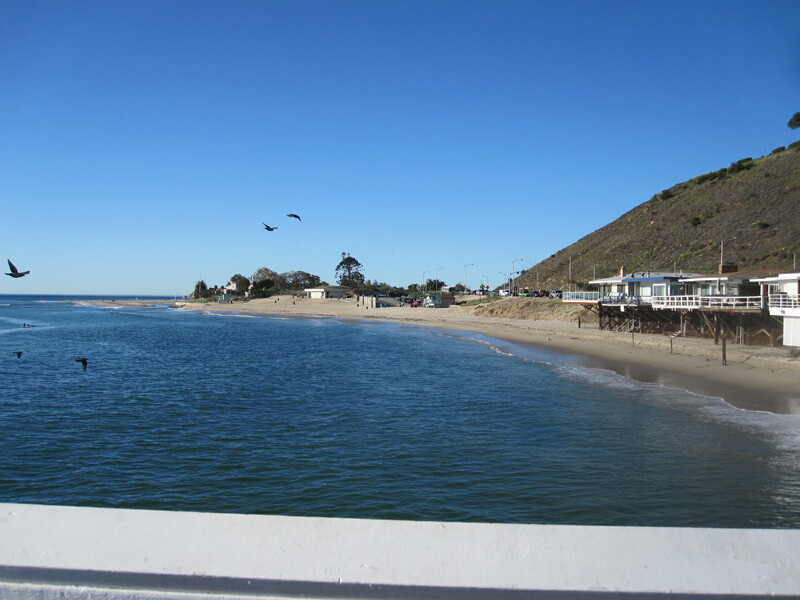 but there was not a lot more to do in Malibu, so I pressed on along the PCH. It continued through the town of Oxnard until it joined the busy freeway 101 at Ventura. 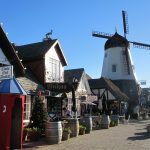 My plan was to stop at Santa Barbara, which I knew to be a really nice seaside town, and then cut across country to an amazing place called Solvang. 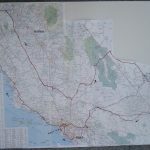 However, the traffic ground to a halt just before Santa Barbara and with the aid of the map in my tablet I found a short cut to the road to Solvang. I was not particularly surprised by this situation, because I knew from past experience that it can be very difficult to get around in popular parts of Southern California at holiday times. again at the end of a vast queue caused by road work with alternate one way flow. Under these circumstances in most countries the traffic moves in blocks of 20 or 30 vehicles every few minutes but in the USA it is different. There you are at a standstill for 15 or 20 minutes and then 200 vehicles go in one block. It probably works out the same in the end, but I find it very frustrating and I arrived at Solvang much later than I expected. 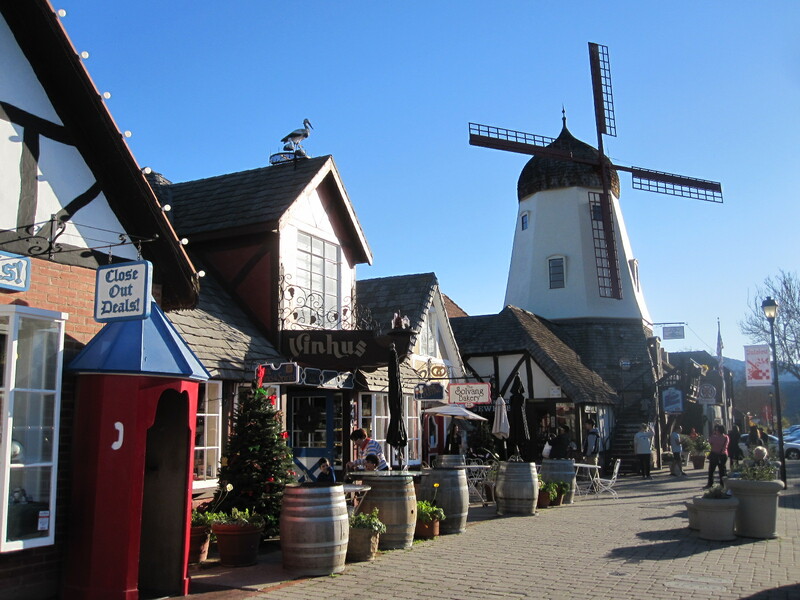 Solvang was founded in 1911 by a group of Danish immigrants who wanted to create a settlement for themselves in the style of their homeland with underlying Lutheran principles. In the 1940s the ‘Danishness’ became more exaggerated with the building of windmills and embellishment of other buildings in the national style, until the place became like a full-sized model village for the amusement of tourists. The shops and cafés sell Danish pastries and other Scandinavian treats and at the time of my visit the central area was occupied by a crowded street market. The town, which has a population of about 5000, seemed even more Danish than on my last visit 10 years previously, although as the founders chose to build their town on terrain that is bordering on mountainous it was a far cry from their homeland. 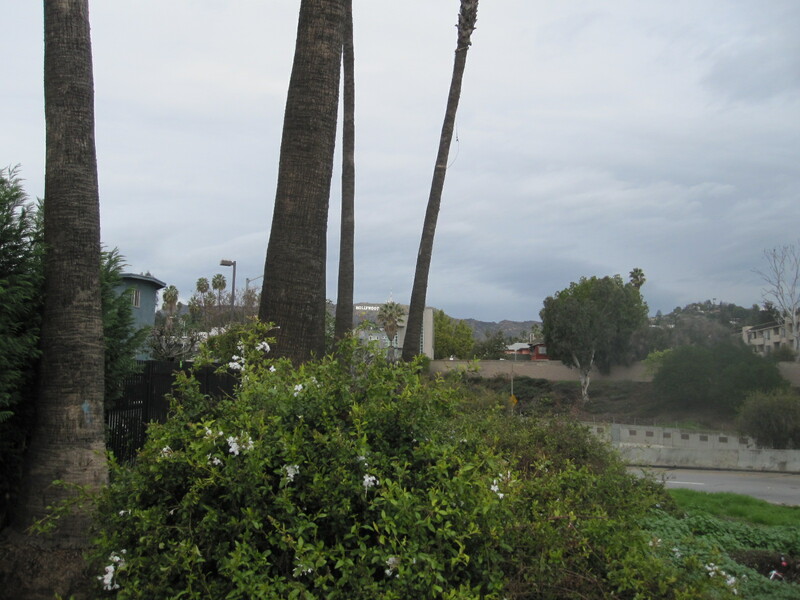 It was dark when I eventually reached Motel 6 North in San Luis Obispo, a pleasant small town with a certain European character but not as outrageous as Solvang. 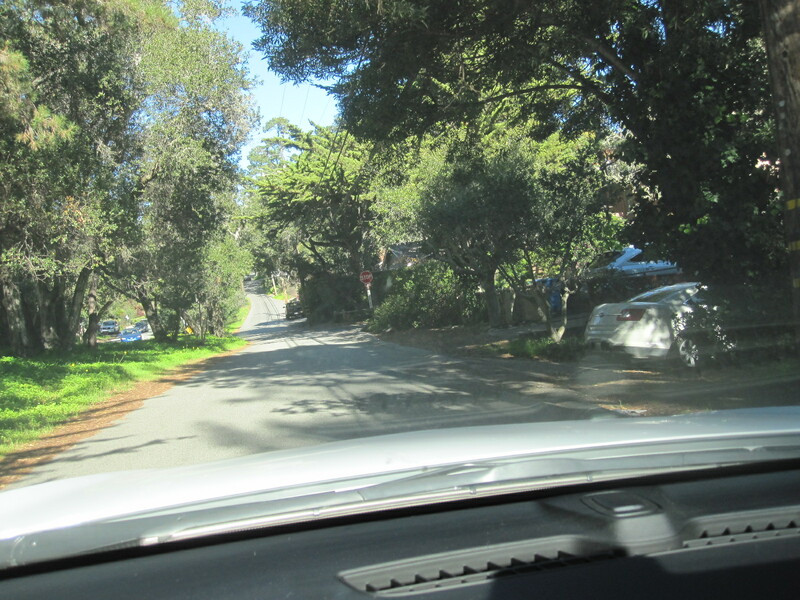 wonders of this road are always driving open Ferraris or Cobras, but even in my mundane Malibu sedan it was really enjoyable as there was little traffic so early in the day. 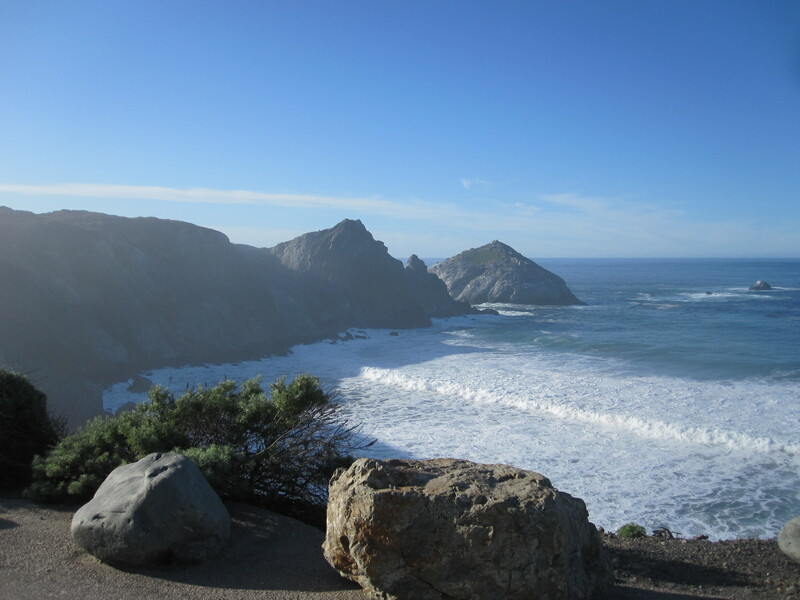 Big Sur is actually a stretch of rugged coastline between San Simeon and Carmel-by-the-Sea, running high along the clifftop with big outcrops of rock offshore, some with buildings on them. 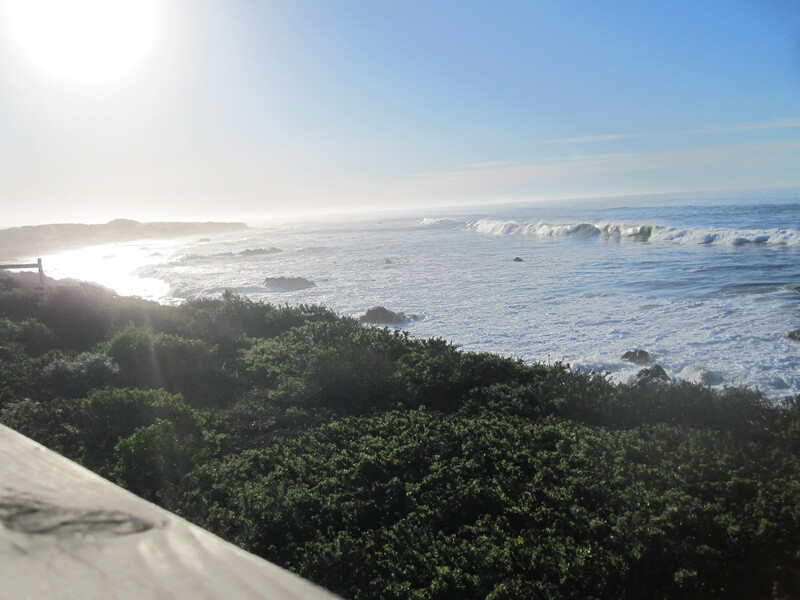 Until I discovered Fernandina Beach in Florida I used to say that Carmel was the World Centre of Niceness. 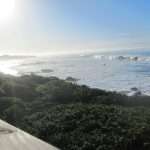 Founded in the early 20th century and occupied from the start largely by people concerned with the arts the town was described as a “village in a forest overlooking a white sand beach” and it has retained this character to the present day. New buildings have to be built around existing trees and new trees have to be planted to maintain a certain density. I spoke to man sitting in a beautiful VW Beetle convertible who told me his mother came from Surrey, and he said he thought Carmel was probably rather like Surrey. It is actually more twee than anywhere I know in Surrey, and I think the closest I could come would be Chislehurst in Kent. 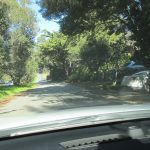 From Carmel it was back on to Highway 1 through Monterey, following the shore on Cabrillo Highway round to Santa Cruz where I turned inland over the hills to San Jose. From there I took the Central Expressway through to Palo Alto and the heart of Silicon Valley, with a couple of diversions to look at the home of the world’s most advanced technology. Basically this is just a vast estate of high tech companies, many with little known fancy names. Some have park-like surroundings with lakes and landscaped grounds, but a lot are just squat single-storey buildings with few or no windows. 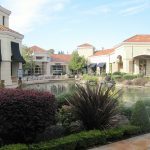 The adjoining towns such as Mountain View and Palo Alto are fairly characterless, but the area has the highest per capita income in the USA at around $144,000 (£115,000) per annum. The rapidly-growing population and shortage of houses has resulted in a situation like that in the south-east of England, with property prices way above normal for the States. 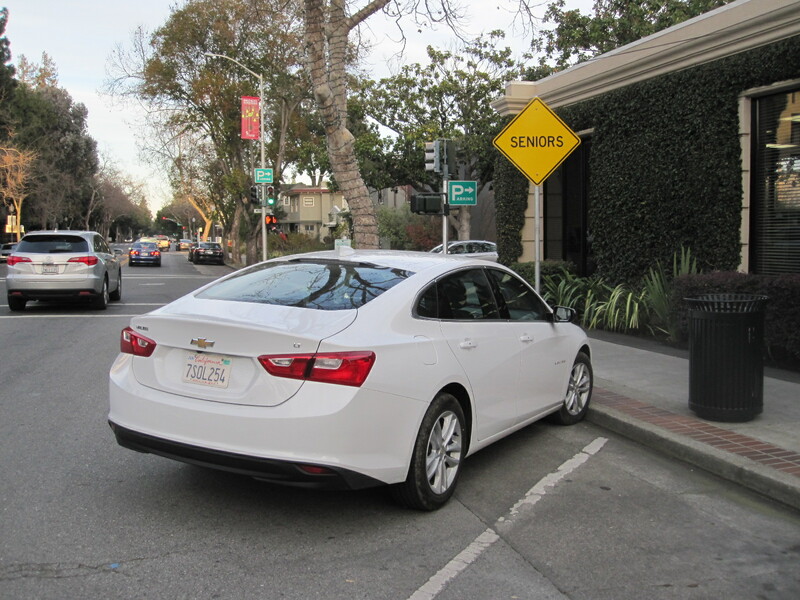 In Palo Alto I took advantage of the availability of a SENIOR parking space to stop for a photograph of the main street. This space was at the end of a row so that it was possible to open the door wide and there was less chance of crashing into another car. 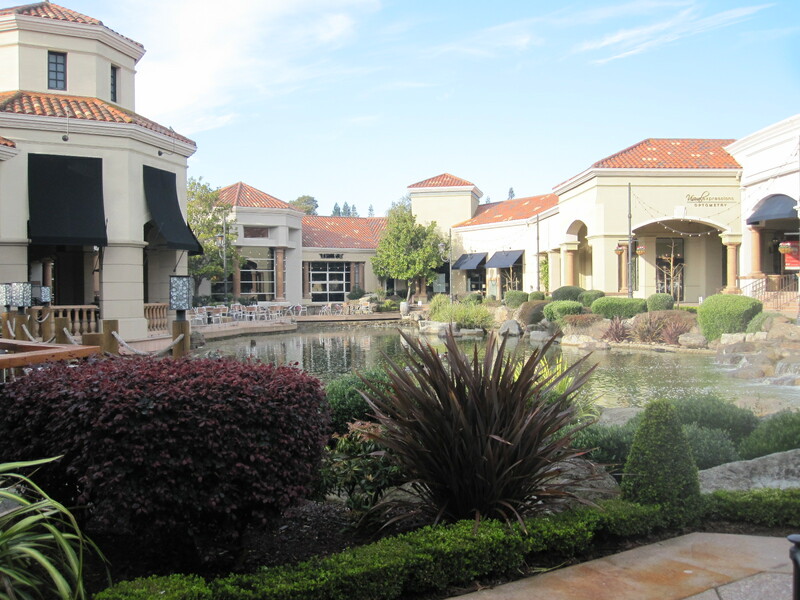 At about 250 miles, some of it slow going, it had been a long day’s drive by the time I reached my hotel in San Ramon . 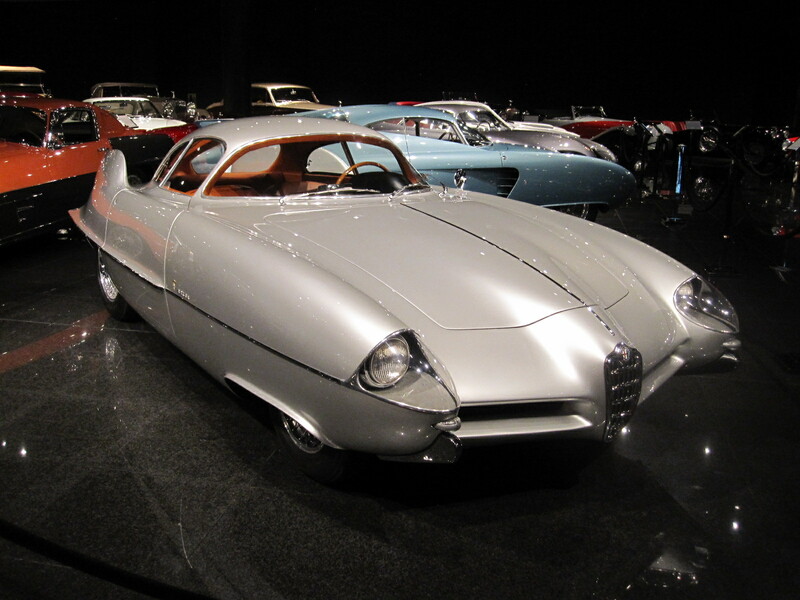 The reason for staying in San Ramon was that it is near Blackhawk, the site of what used to be one of the best car museums in the world. First stop the next morning was the museum, at the centre of a very upmarket shopping mall and it turned out to be rather disappointing, because the display was only about one third of the size at my previous visit. They still had many unique and interesting vehicles but it was just not as memorable as before. 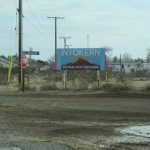 It was still the aftermath of the Christmas holiday, and the rest of the day was spent in a frantic 250-mile nose-to-tail dash down the freeway to Bakersfield. At one point it was the nearest to a motorway pile-up I have ever been in, with everybody screeching to a halt at angles all over the road and it was miraculous that there was not a serious hold-up anywhere. 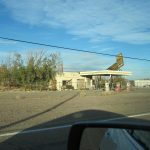 By the time I got to Bakersfield it was dark, pouring with rain, impossible to see any road markings and even more miraculous that I eventually found the Vagabond Inn motel. The next day was an unbelievable contrast. 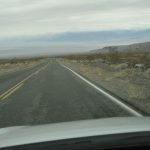 I set off with another 250-mile stretch in front of me, crossing the desert including Death Valley, to a small town called Beatty in Nevada. From the start there was little traffic, and once I got clear of Bakersfield there was practically nothing at all for a long time. Vast areas of the desert are given over to military bases, and at Mojave I diverted for a few miles to look at the Air and Space Port with one of the famous aircraft ‘boneyards’, where civil and military planes are dismantled for spares or mothballed for possible future use. They were clearly visible but despite strenuous attempts I could not get close enough for a decent photograph and the Air and Space Port is not nearly as exciting as it sounds. 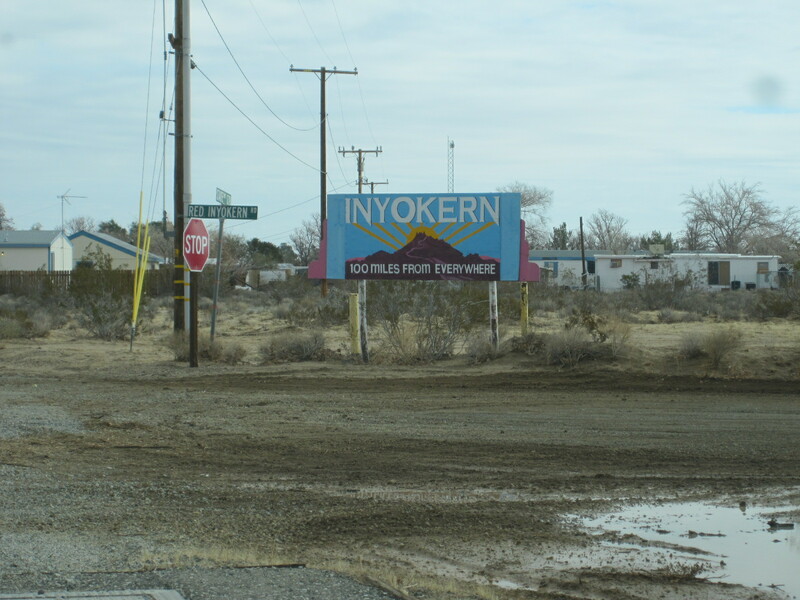 Shortly before China Lake the road ran through Inyokern, a small place with a large sign pronouncing INYOKERN – A HUNDRED MILES FROM EVERYWHERE. Not strictly true, but if you were a teenage resident it would probably feel like it. 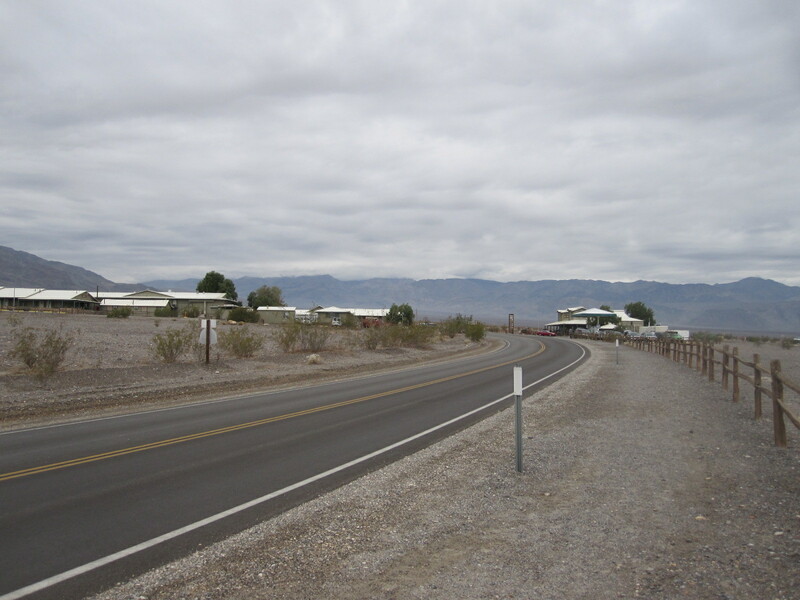 The entrance to the China Lake Naval Air Weapons Station is hardly discrete, with a jet fighter in front of it and security is obviously tight, all the important stuff (if there is any) being kept out of sight from the road. China Lake is dry, and undoubtedly has been for a very long time. Before driving through the desert proper the advice is always to take plenty of water and food, which I stopped for in Ridgecrest some distance before Death Valley. It was New Year’s Eve, and I must admit that I was slightly concerned that the roads might be totally empty and the rangers would not operating, which could be a problem in the event of a breakdown, as there is no mobile phone signal most of the time. 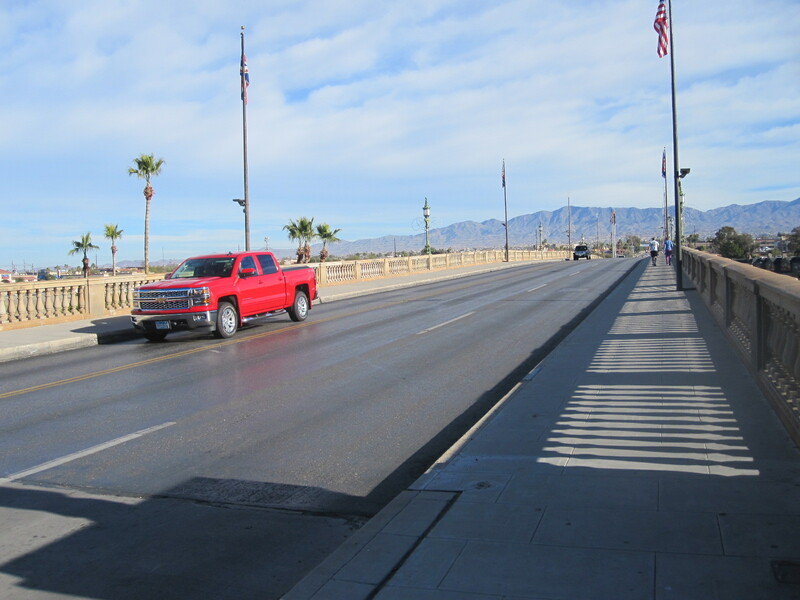 In fact, winter is actually peak season for the desert, and by mid-day there was more tourist traffic than I expected. 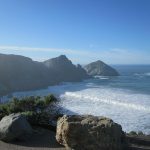 Other than in a few small pockets the deserts of the south-west USA are nothing like the popular image of the Sahara, with its massive rolling sand dunes. The roads are mainly single-carriageway strips of tarmac, sometimes dead straight as far as the eye can see into the distance. There is always a mountain backdrop and occasionally the road will climb to cross the mountains through a pass. Between the road and the mountains the terrain is sparsely covered by scrub, small bushes or cacti, and in the winter can be quite colourful. 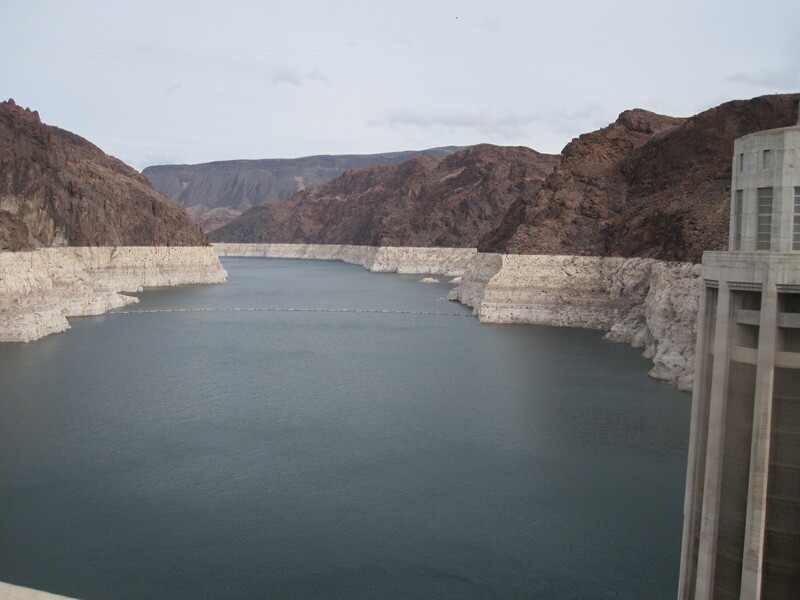 The mountains themselves are not exceptionally high but varied in shape and the lower slopes are characterized by alluvial fans, large deposits of soil and rock in the form of an inverted fan. Vehicles can easily blend into the background on these straight roads, and it is normal to drive with headlights on in broad daylight. 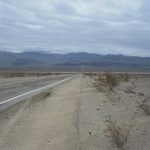 Driving on open land is not allowed, but there are many rough-surfaced highways than can be legally used by 4x4s and motorcycles, some leading to remote areas and ghost towns. 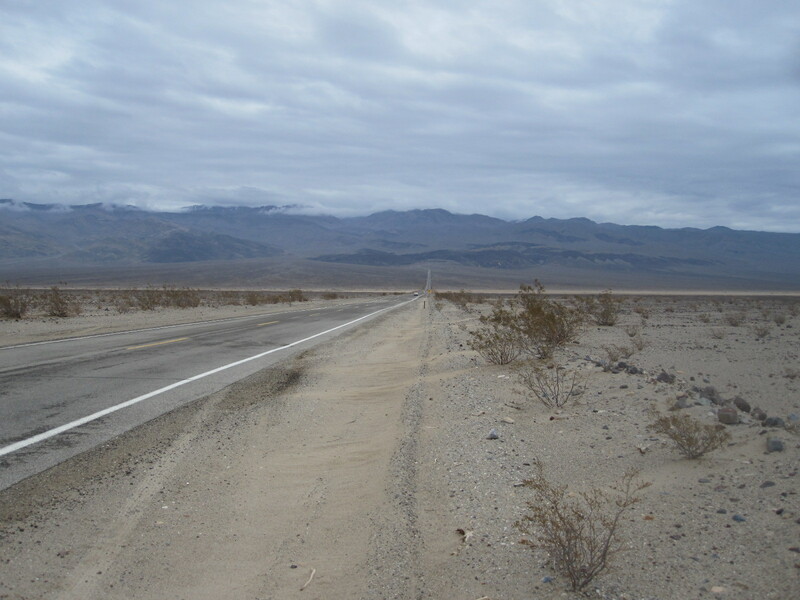 About 60 miles after Ridgecrest the road passes through Panamint Valley to Panamint Springs, and I stopped for a while at the roadside where I once spent several hours locked out of the car in blazing sunshine, as described elsewhere under “Locked Out in the Desert”. 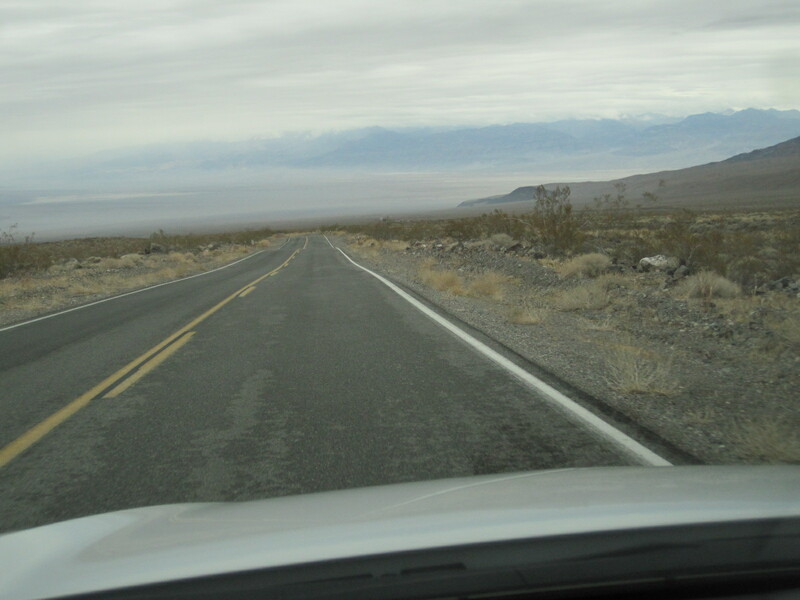 From here the road climbs over Panamint Range and enters Death Valley Nation Park before dropping down to the visitors centre at Stovepipe Wells, which as the name suggests, is subject to extremely high temperatures in the summer. When Turtle Wax car polish appeared in Britain in the 1960s I remember that it claimed to have been tested at 140 degrees “in fiery Death Valley”, but I certainly never imagined that I would ever go there. In actual fact the highest air temperature recorded in Death Valley is 134 degrees Fahrenheit, and that is sometimes claimed to be the highest on earth. At the time of my present mid-winter visit it was only about 60 degrees at mid-day and would fall to just below freezing at night. happened I had the receipt for the charge of $10 on my 1999 visit still stapled to my map, an example of the level of inflation that has applied to many things in the intervening period. Bearing in mind that I was actually only driving about 40 miles in the National Park this made it an expensive visit. Shortly after Stovepipe Wells the road to Beatty branched off towards Daylight Pass on the Nevada state border, and I was relieved to find that it was open, because roads in this region are often closed for one reason or another and the diversion would have added about 140 miles to my journey. 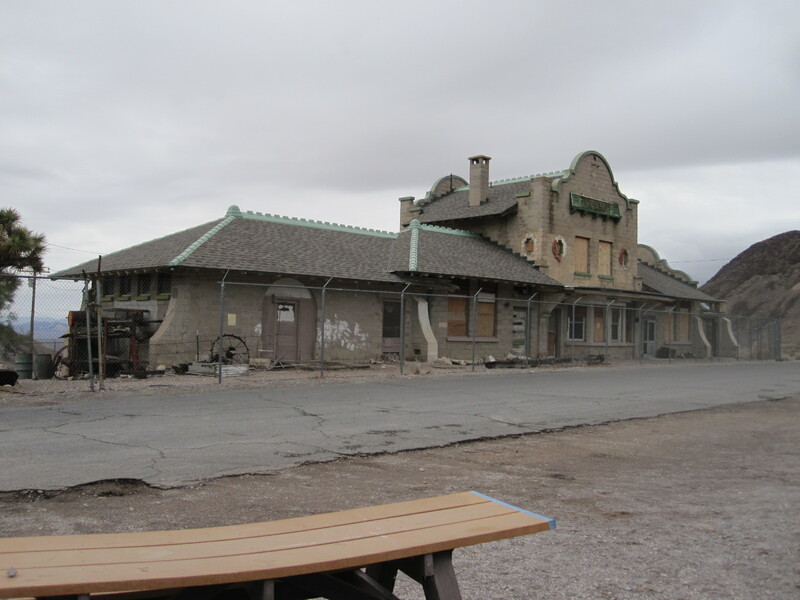 This also gave me the opportunity to visit Rhyolite Ghost Town. 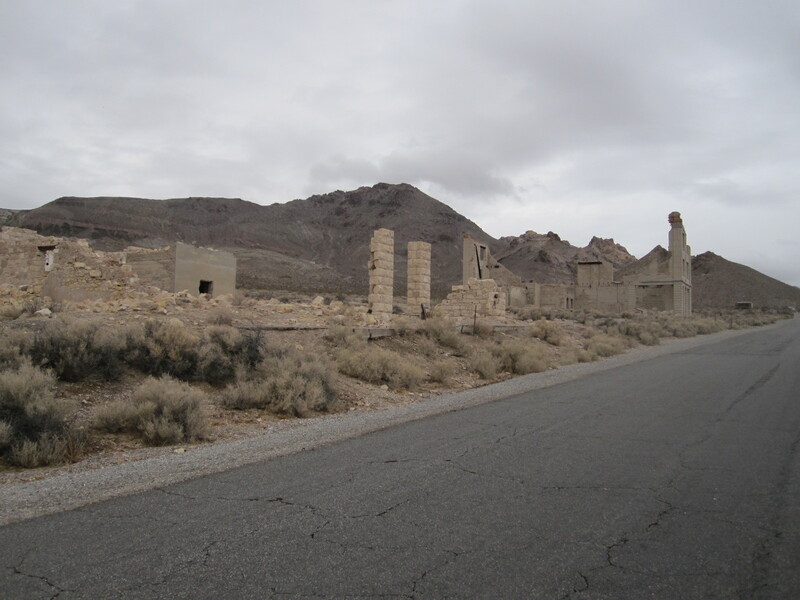 Rhyolite was founded in about 1905 and faded away after 1920 when the gold mine ceased to be viable. It is hard tobelieve today, but the population rose to about 5000, and the town had a stock exchange, banks, schools and a railway station. 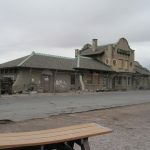 Many of the buildings were relocated to Beatty a few miles away and the best remaining one is the railway station, which is easily recognisable as such although it is derelict. Some other buildings exist today only as facades or skeletal remains, and a few people still live in Rhyolite in ramshackle sheds or trailers. 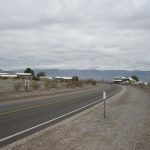 On to Beatty, which to my mind is a wonderful place, mostly a shanty town of motorhomes, trailers and prefabricated structures, together with a few substantial buildings including the excellent Death Valley Inn, which provided my accommodation for the night. This is the only time I have stayed in a hotel with “Death” in its name, that being a subject that most people in the hospitality business tend to avoid. 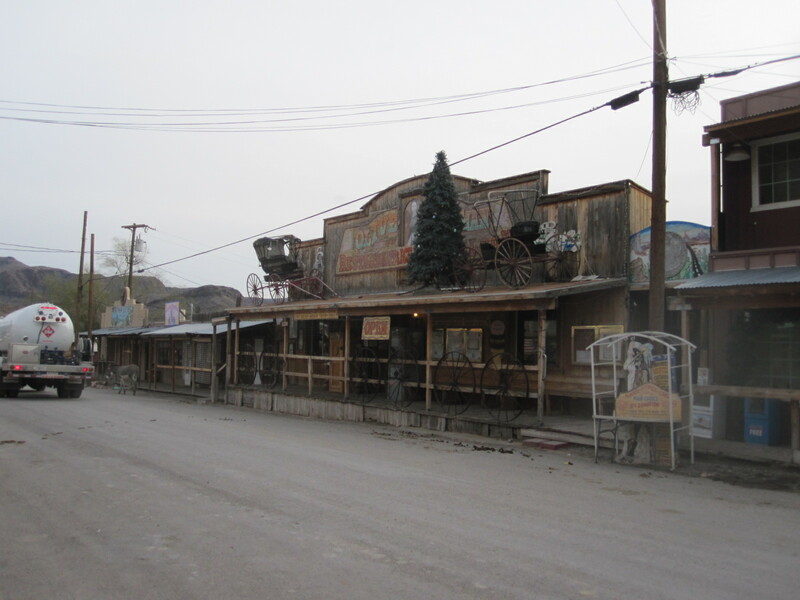 Beatty is a proper desert town, with vaguely-defined dusty streets and a general untidiness that I like. Here and there are hints of the possible presence of alien beings, in the form of pictures of creatures with pear-shaped heads and big eyes from the world of science fiction. 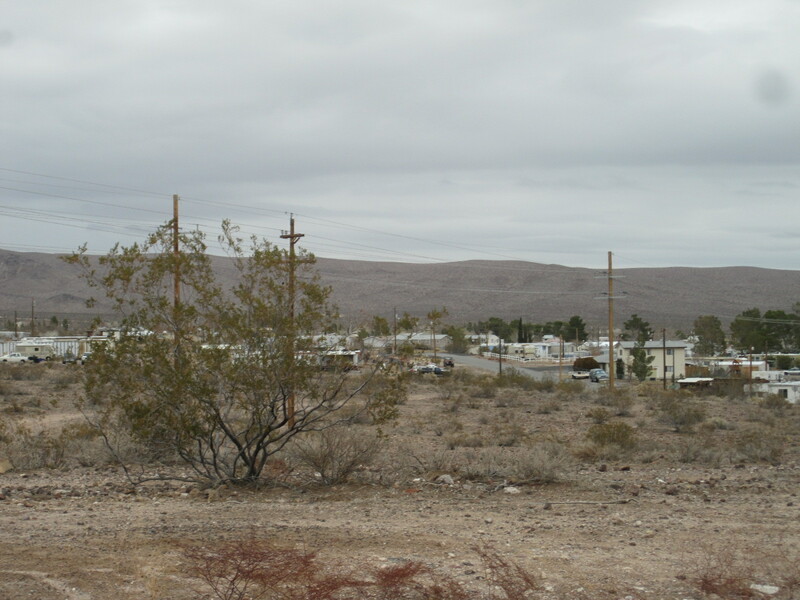 This is because Beatty is the closest significant place to the legendary Area 51 and the Nevada Test Site. Area 51 is an Air Force base at Groom Lake in the desert and was probably the most heavily guarded and secret government establishment throughout the Cold War period. Its existence was totally denied until 2005 and it was not shown on Google satellite maps, although it was on Russian ones. It was rumoured that alien beings and their artefacts were kept there, possibly linked to the ones involved in the famous Roswell Incident in New Mexico. The most advanced aircraft were developed and tested at Area 51 and some people believe that it was those that gave rise to the many UFO sightings in the region, rather than actual aliens. 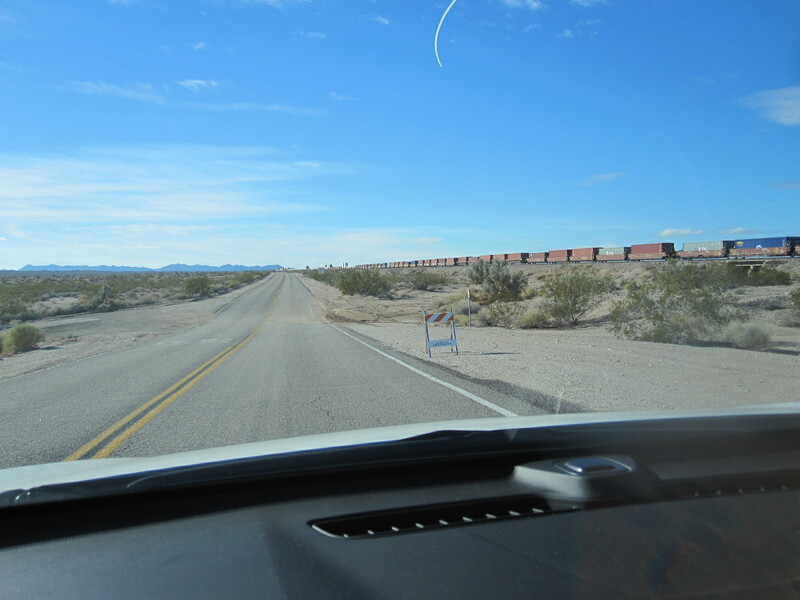 People often try to drive across the desert to Area 51, but eventually come to fences, barriers and signs warning of dire consequences for anyone who tries to breach the US Government security. The Nevada Test Site is another matter. This was used for above-ground testing of 100 atomic bombs from 1951 to 1962, with very many more underground until 1992. 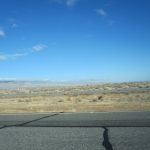 The site is about 65 miles from Las Vegas (and much closer to Beatty), and the government used to announce the dates and times of the tests in advance. This became a major tourist attraction in Las Vegas, and improbable though it seems today, people would go out with dark glasses on to the balconies and rooftops to watch the explosion and mushroom cloud. There must be many thousands of people in the USA who have seen a live nuclear explosion. So on to Las Vegas via highway 95. 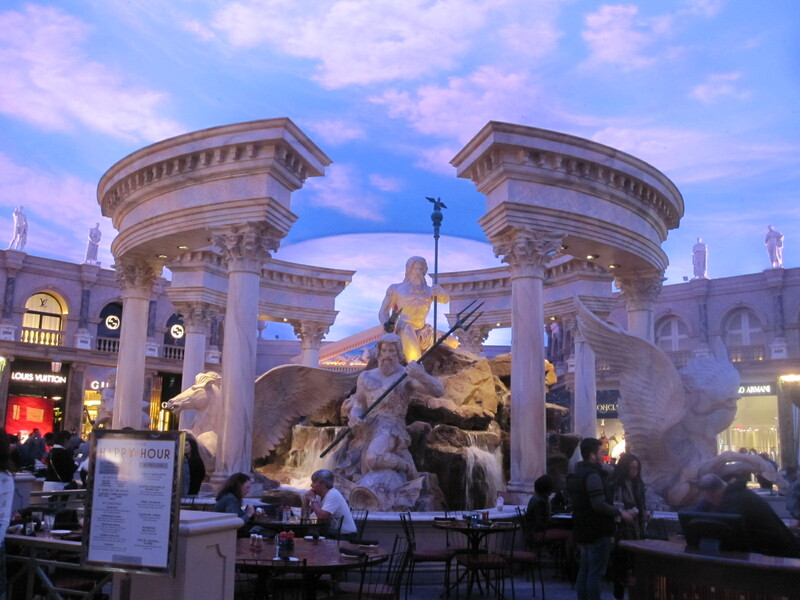 Everybody should go to Las Vegas, even if they know they wouldn’t like it, just to experience this monument to excess and example of man’s ability to transform a large area of almost barren desert into something totally ridiculous. 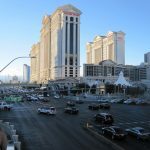 It is all based around Las Vegas Boulevard, known as “The Strip”, a wide thoroughfare about 4 miles long lined with enormous hotels combined with casinos and shops, mostly themed in some way to attract visitors away from the competition. My hotel, “The Stratosphere”, was towards the northern end of the Strip, some distance from most of the action, and takes its name from the tower that rises out of it to a height of 1149ft, claimed to be highest tower west of the Mississippi. This place was a completely new experience for me, a totally self-contained world in which it was possible to disappear for any length of time, with 2,427 rooms, a vast casino, many restaurants and fast food places, a gym, a pool, plus lots of shops of all sorts. It took me quite some time to fathom out how to get from the enormous car park to the reception. There were four banks of lifts in different parts of the building, and the one that served my room had eight lifts in it. 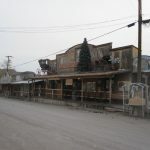 The northern end of the Strip has a reputation for being seedy, and some of the people who wrote reviews of the Stratosphere said it was not safe to walk in the street outside. It was early afternoon when I set off to go downtown on the Metro, which runs behind the buildings on the other side of the Strip and the station was about 300 yards away. Walking to the station was also said to be risky, but by American standards I thought it was OK, though there were a few slightly unsavoury-looking characters around as there usually are in American cities. The best answer is to be not too savoury-looking yourself, and just in case, I wore my £4 watch. 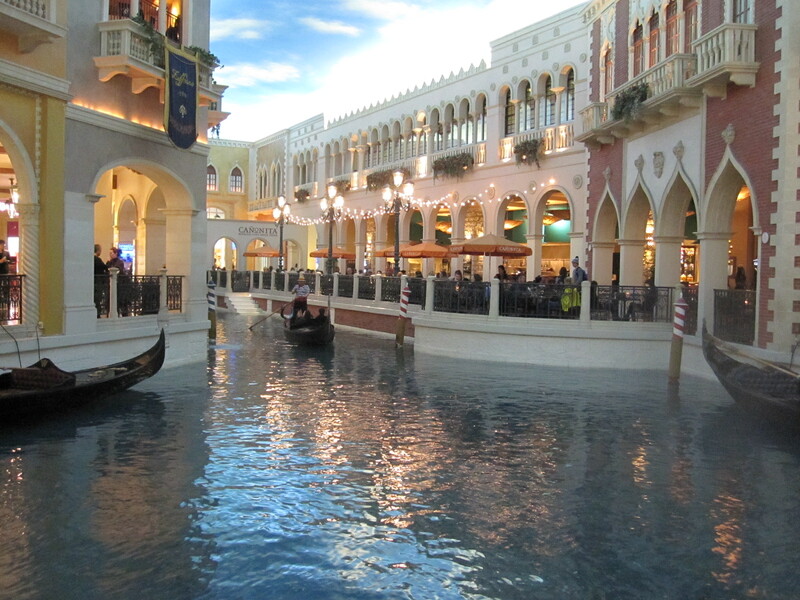 It was New Year’s Day, and the main part of the Strip turned out to be uncomfortably crowded. The general layout of the casinos follows a standard pattern. Those that are set back from the road have an area in front laid out according to the theme, i.e. 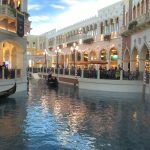 musical fountains for Bellagio, Eiffel Tower and Arc de Triomphe for Paris, bridges and canals for the Venitian. The main doors usually open straight into the casino which may continue some aspects of the theme, leading through to the shops and restaurants which will also be in themed streets and squares. In some cases there are spectacular displays with flames rising high into the “sky”. The blue skies and white clouds are cleverly done, and at times it is easy to forget that the whole thing is indoors. The next day I suffered a setback due to failure of the Metro in the morning. 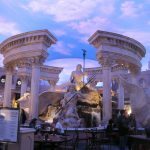 There are supposed to be regular buses on the Strip but they didn’t seem to be operating and I finished up paying a fortune for a taxi to the LINQ casino with its famed car collection. 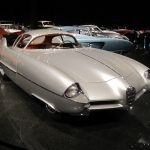 Formerly known as the Imperial Palace collection, this was one of the best car museums in the world, but sadly, like the one at Blackhawk, it has been watered down and is now a classic car dealership with far less interesting content. 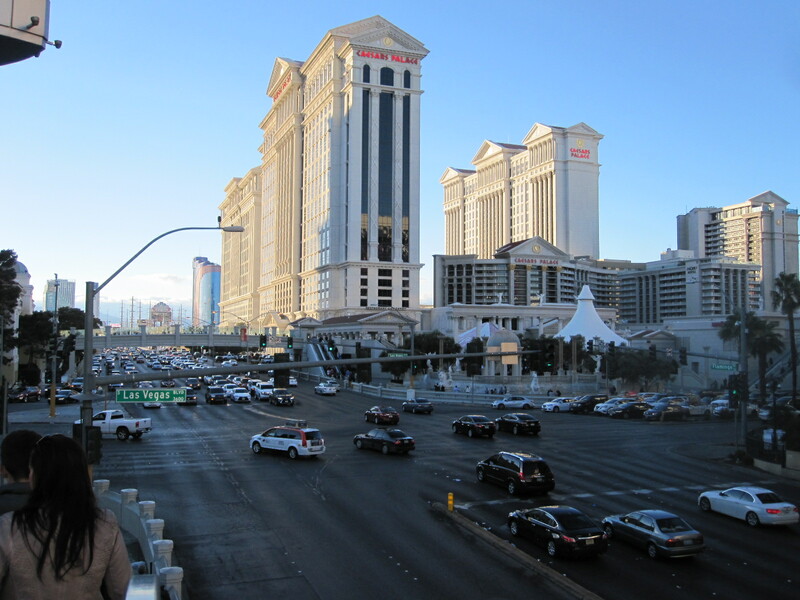 The Strip was much less crowded than before and the rest of the day was spent looking at some of the most entertaining themed malls in the casinos This entailed crossing the road several times using high bridges served by escalators up and down, about half of which were out of order, a source of complaint by many people. Mr.Trump says he will get America working again, so perhaps he could start by sorting out the escalators and Metro in Las Vegas. 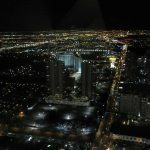 As a guest in the Stratosphere I was entitled to a 75% reduction in the price of a ticket to go up to the observation platform of the tower, with its 360 degree view over the city and surrounding area, so I went in the evening and was not disappointed. 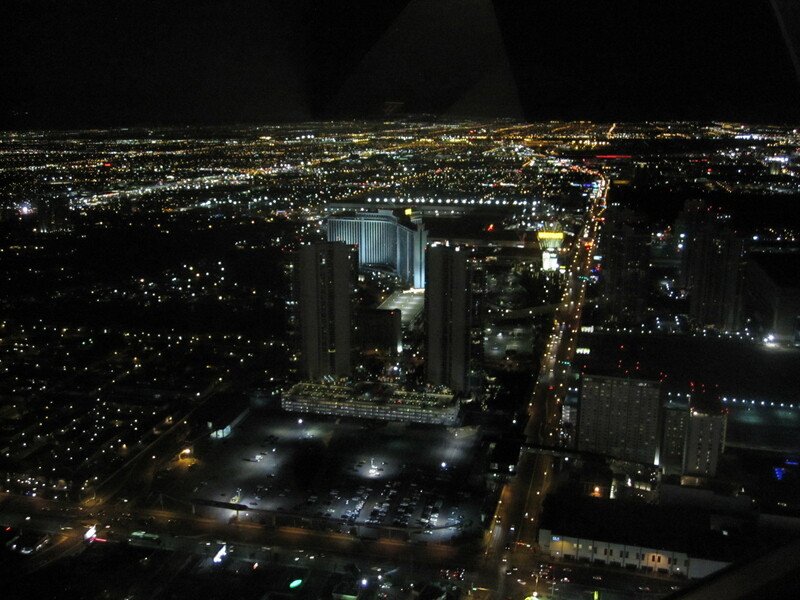 Outside, adjacent to the observation platform, is a ‘ride’ consisting of a sort of rack on which, if you felt so inclined, you could sit with your legs dangling and be shot forward into empty space 1100ft above the bright lights of Las Vegas. Strangely, I did not feel so inclined, but plenty of other people did. 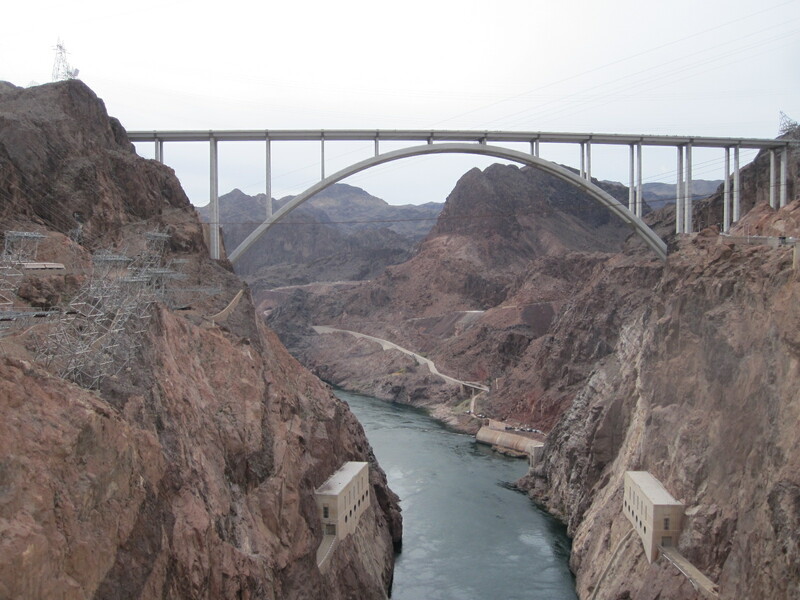 Back on the road the next morning, the first port of call was the Hoover Dam, a monumental feat of 1930s engineering situated in the Black Canyon of the Colorado River. 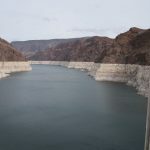 It incorporates a hydro-electric power station, and until recently the main highway US93 ran along the top of the dam wall, crossing from Nevada into Arizona. The architecture is very 1930s, with a concrete tower in each State showing the local time (one hour difference), and facing onto the road are massive elaborate brass doors that are kept highly polished. 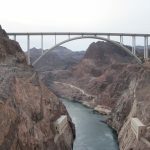 In 2010 US93 was transferred from the dam wall to a new and spectacular bridge that is fully in keeping with the existing structures. 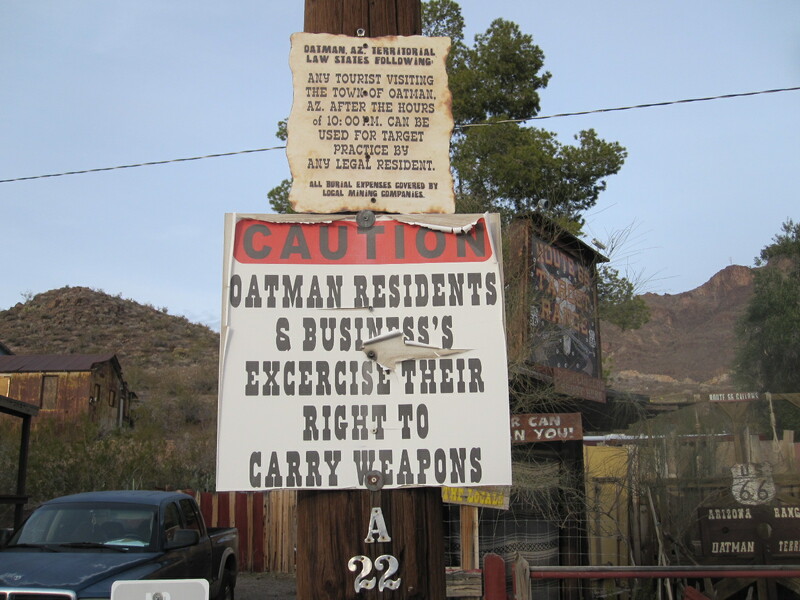 I took the old road over the hills to Oatman . This stretch of the old Route 66 must be one of the least changed anywhere and some of it is like a narrow twisty Welsh mountain road. Oatman itself is very tourist orientated but quite authentic, with burros (small donkeys descended from pack animals) wandering about the main street. They are generally friendly, in the hope of getting something to eat, but there are notices advising that they can turn nasty. 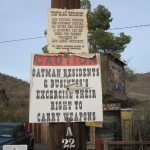 Oatman must be one of the most original Western towns left, and the gold mine has actually reopened from time to time in tune with the price of gold. Visitors generally receive a better welcome than a sign in the street might suggest. 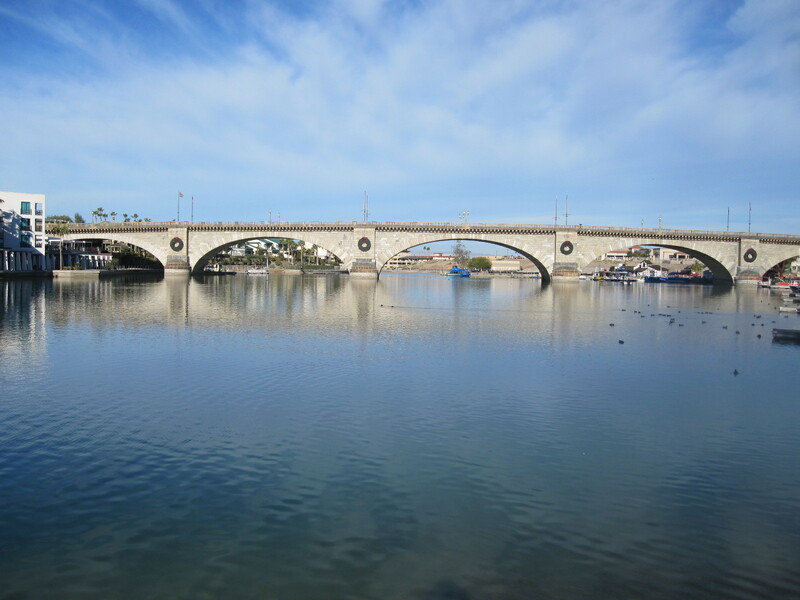 Continuing south through places with unlikely names such as Golden Shores, Catfish Paradise and Desert Hills I arrived at my night stop in Lake Havasu City. 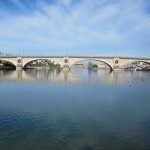 This is perhaps best known as the home of the old Lo ndon Bridge which was transplanted from England brick by brick in the late 1960s, and full details can be found elsewhere on this site under ‘London Bridge Arizona’. To my surprise I could actually see the bridge from my room in Motel 6, and the next morning I went for a walk around and over it with my camera. It is clearly a major attraction, and lots of people, young and elderly, were taking their morning exercise by walking or running on the paths around the bridge and adjoining lake. Before leaving town I also drove over it but still couldn’t identify the place where I broke down in 1961. 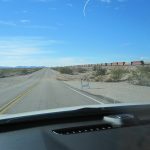 Originally I had intended to go down to Yuma and drive along the Mexican border, but decided that it was simply too much driving, so I would go back up to a town called Needles and follow the old Route 66 to Los Angeles. In Needles I managed to get a map of the ‘Mother Road’, but had some difficulty in getting on to it. Eventually I found a signs to Goffs, which was definitely on Route 66, and nearby was a board with a handwritten notice stating FLOODED. It looked as if it had been there for some time, and everything was very dry, so I decided to carry on. The terrain became desert-like but with humps and dips in the road, the humps being just large enough to hide a car and the ground on either side in the dips looked like dried river beds. It was clear that in wet periods considerable quantities of sand and mud had been washed on to the road, and in fact I discovered that these low points are known as ‘washes’. In periods of heavy rain, which occur in the winter, a considerable amount of water can accumulate in the dips and strict advice is not to attempt to drive through it, because it is often deeper than it looks. The problem is, of course, that if you encounter such a flood and turn back the dips behind you may also have flooded and you will be trapped, probably at least for some hours. Just to get me worried, at one low point there was water up to the road on both sides and the sky in front became black. It started to rain, but fortunately came to nothing. 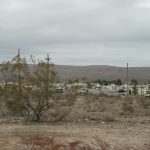 At Fenner, where route 66 crosses Interstate 40, the road that supplanted it, there was some development, but on the whole it was not a particularly interesting drive. 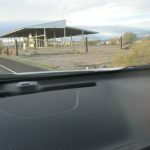 The next stretch, the loop through Essex, Chambless, Amboy and Bagdad to Ludlow was better, with a number of abandoned relics of the past and a service station in Chambless advertising FLYING SAUCER REPAIRS. It would be interesting to know how many they have done and how they found out how to do it. Perhaps they have alien mechanics. There was little traffic on this road and I was doing 60mph most of the time. 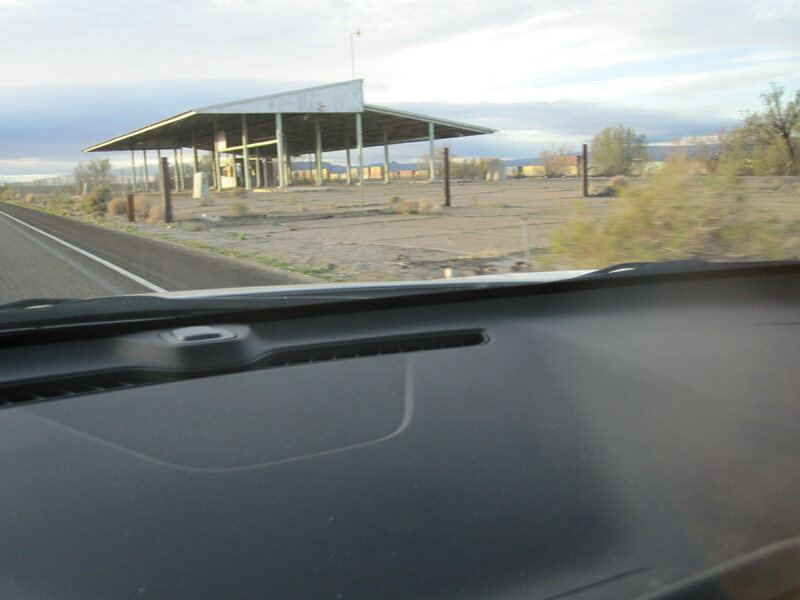 When the trade fell off after I-40 was opened the existing businesses were just left as they stood with the signs falling down and buildings turning into hollow skeletons. 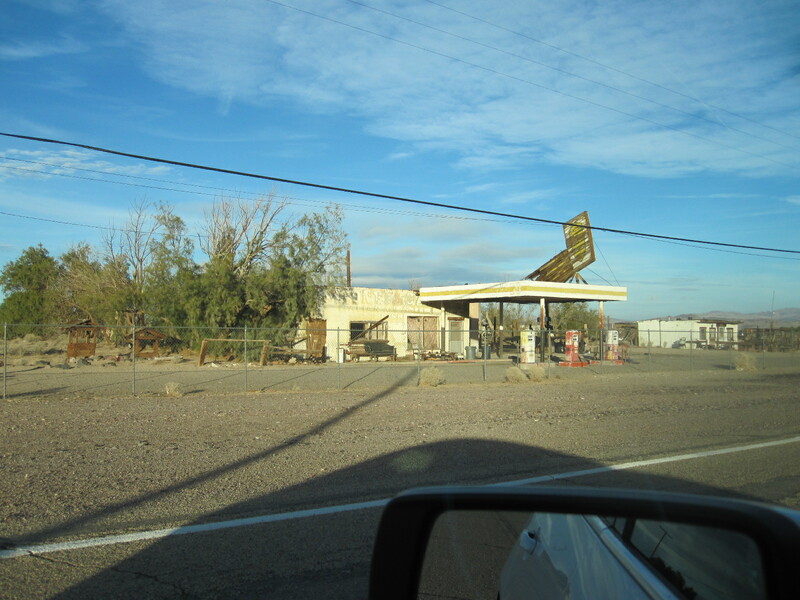 One notable place still more or less complete is the Bagdad Café, the location of a 1987 film. At Ludlow the old road runs alongside I-40, but is so rough-surfaced with small potholes like a Russian road that I moved across to the freeway. As it was only about 50 yards away I not feel that I was cheating too badly and anyway before reaching my night stop in Barstow I moved back to the proper route which was then in better condition. 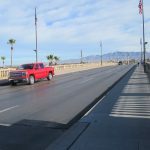 Barstow is a desert town famous as the base for motor sport events and adventure driving, but otherwise doesn’t have a lot going for it. 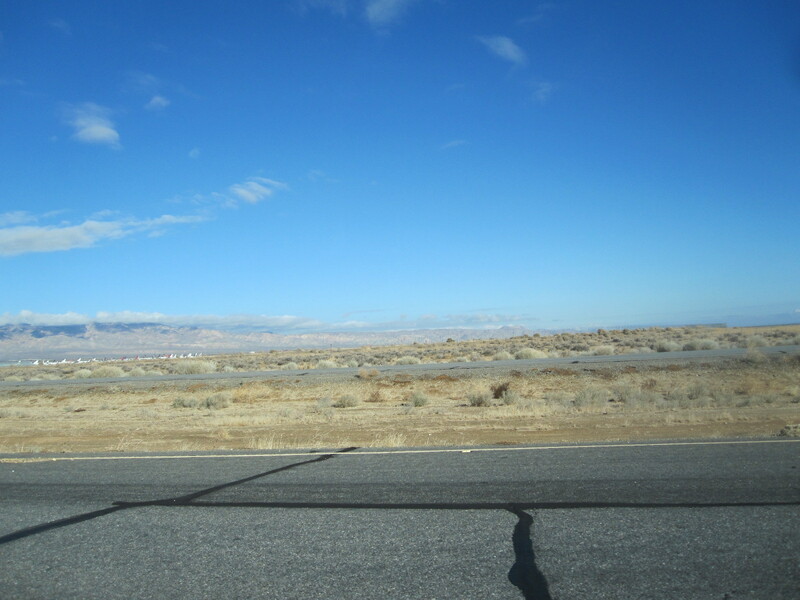 From boring Barstow I continued on Route 66 to Victorville where I had a minor problem with the car. After breakfast sitting next to a madman in a roadhouse I came out to find that the too clever by far car was indicating low pressure in one rear tire. The nearest tire shop provided no service at all but the man in the next one was very helpful, checking the tire and blowing it up to the correct pressure for no charge. Following a short stretch of freeway I was back on the old 66 to San Bernadino, where there used to be some good motorcycle shops. The city centre was quite smart with traditional slightly Gotham city-style civic buildings set among trees but with no shops of any sort and few people around. Parking was free and easy. A brief visit to the library proved fruitless as far as information about motorcycle shops was concerned, the only ones being miles away. The rest of the day was spent driving along the enormously long Foothill Boulevard (still Route 66, mostly built-up) and shopping before finding America’s Best Value Inn in Rancho Cucamonga. Not a very successful day. 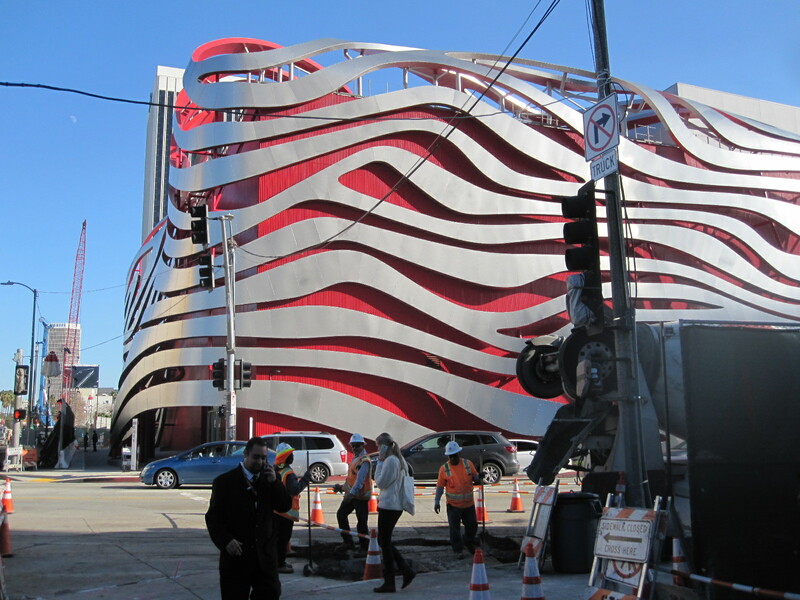 The plan for the next morning was to drive down to the Petersen Automotive Museum on Wilshire Boulevard, have another look at the Hollywood area and meet my late cousin’s son with his family for a meal in the evening. From my hotel to the museum was about 40 miles including a dedicated freeway from Pasadena towards the city centre, and before setting off I planned the route carefully. The driving I had done so far in LA had been reasonably civilized, but I knew it was not always like that. There are parts of the city that are effectively no-go areas for strangers and in the rush hour the traffic is either standing still or going like hell. I was late enough to avoid the worst of the traffic and my route to Wilshire Boulevard worked well. As 0pposed to most of the area, Wilshire Boulevard has some interesting Art Deco buildings, although it was in a state of chaos due to the building of a Metro. 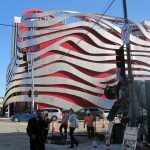 The Petersen Museum is in the part known as Museum Mile, along with the La Brea Tar Pits, the LA County Museum of Art, and a number of other art centres. 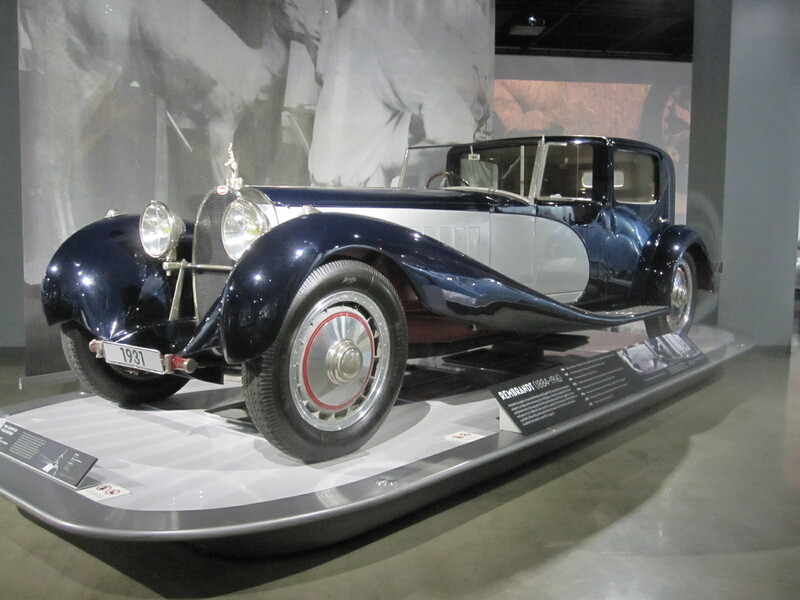 Unlike the other car museums on this trip the Petersen exceeded expectation, with a special display of Bugattis, mainly from Peter Mullin’s collection in Oxnard, and many other outstanding cars. It also had simulators on which you could drive various cars in races on well-known circuits. I finished up in an original VW Beetle at Laguna Seca, and after several races involving multiple collisions caused by me I started to feel sick and had to give up. Some people are very good at these things, but I find it hard to come to terms with the complete lack of G forces corresponding to the visual image. Hollywood was still busy but at least this time I managed to get a photo of the famous sign high up on the hill above. By the time I got to the Pasadena Freeway it was rush hour and a chance to experience LA traffic at its most furious. The freeway is a concrete road between high walls with almost continuous bends and hills, and it was clear that everyone except me drove it every day and knew it well. It was actually quite like a real life version of the Beetle race on the simulator and I was quite hard pressed to keep up, although I managed to avoid causing a pile-up. In the evening I met my cousin’s son and his family for a meal at Lucky Baldwin’s English pub in Pasadena. Lucky Baldwin was not English, but was a very successful businessman and flamboyant character in California in the second half of the 19thcentury whose name became attached to a multitude of ventures. The pub is probably about as close to an English one as you could get in that part of the world, with good food (including fish and chips) and friendly staff. On the way to the airport the next day I took a better look at Santa Monica, which is a really smart town with a good beach and a strong emphasis on cycling. Many people were taking advantage of the recently marked cycle lanes, but I got the feeling that they were not universally popular and were leading to some friction between different road users. 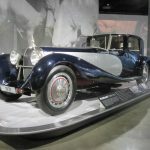 Before taking the car back I just had time to call in to the well-run and friendly Automobile Driving Museum in El Segundo close to the airport. 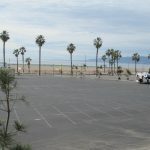 Taking the car back is always a slightly daunting prospect because it can often be difficult to find out where to go, but LAX is a model example of how it should be done with all the car rental bases close together and clearly signposted.